Religious freedom has become a a hot topic in the world of Canadian law again this autumn, as the Parti Québécois presented a new bill, Bill 60, which seeks to enact the “Charter of Québec Values”. The proposed charter aims to prohibit the wearing of “overt and conspicuous” religious symbols by government officials and public servants. The rumoured charter was widely discussed across Canadian news outlets throughout September and October, and was finally tabled in front of the Québec legislature on November 7th, 2013 as the “Charter of Québec Secularism”. The proposed new law would amend the Québec Charter of Human Rights and Freedoms in an attempt to prevent religious symbols to form part of the public sphere; this echoes the measures of state secularism eschewed by other governments, such as that of France. Figure 1: Types of permitted religious symbols. Figure 2: Prohibited religious symbols. According to ReligionNews.com, the charter “would prohibit public employees from wearing large crosses and crucifixes, Islamic headscarves, Sikh turbans and Jewish yarmulkes as a way to establish ‘religious neutrality’ in public. The prohibitions would apply to civil servants, teachers, law enforcement officers, firefighters, doctors, nurses and public day care employees. Elected officials would be exempt.” Thus, anyone seeking to serve in the public service would be required to disregard their own personal religious practices if these could be interpreted as “overt”. While media reports and online discussions have concentrated on the possibility of these guidelines being a disguise for racist or xenophobic motivations, I believe they are missing the essential dilemma that characterizes the problems with Bill 60. The proposed measures aim to limit the infringement of citizens’ religious freedoms by preventing others from imposing their beliefs by virtue of wearing visible symbols. However, as I have written before, there is no official agreement in Canadian federal or provincial law about what constitutes a “religious symbol”. Freedom of religion has been discussed in Canadian human rights law since the 1950s and no unanimous decision about what constitutes “religion” has been reached. Therefore, the allegations that the guidelines provided by Bill 60 are racist or targeted toward minority groups skim the surface of a deeper, more troubling realization: that perhaps there is no such thing as stable concepts of “religion” and “secular”, and that the insistence that there is such a distinction leaves room for deeply troubling lines to be drawn arbitrarily. The realization of the lack of objective, clear-cut categories and its consequences is at the heart of work done by scholars of critical religion. My recently completed Master’s dissertation, as well my first blog post for the Critical Religion Association, have dealt with the consequences of work discussing critical religion in relation to processes of law. I argued that defining what is “religious” and what is “secular” for the purposes of enforcing the religious freedom in Canada is impossible, as provincial and federal law do not (and cannot) define “religion” in their most important documents. The definition of “religion” is left to the interpretation of the courts at key moments of dissension; the courts, in turn, rely on both outdated legislation and on precedence dated back to an era where Canada was understood to be “a Christian country”. Attempts have been made to remove tradition-specific language from legal statements, but without the context from which the word “religion” and its cognates emerge, statements about “religion” and its essence leave an overwhelming amount of room for processes of power to dictate, at any point in time, what is permitted and what is prohibited. The decision of what constitutes a religious symbol is left in the hands of lawmakers, who necessarily have their own idea of what religion “is”. Little room is left for debate over whether the symbols depicted in Figures 1 and 2 are understood by their wearers as religious. 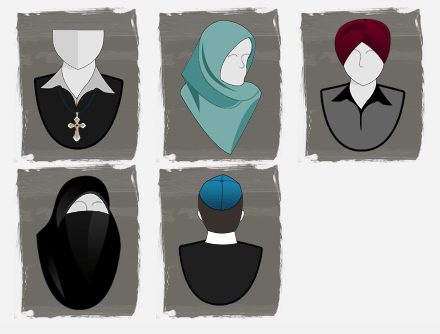 Those who wear items such as the hijab or the yarmulke might not categorize those items as “religious”, but rather as “cultural” or “traditional”. They may even consider these reasons to be as equally important as so-called “religious” values, and believe that these deeply-held values should be honoured in a similar fashion. Therefore, the line that the “Charter of Québec Values” draws between permitted “religious” symbols and prohibited ones assumes a number of things. First, it assumes that the distinction between “religion” and “secular” is clear-cut and that lawmakers have an objective view of what counts as a religious symbol. Secondly, it assumes that that “objective” point of view is somehow completely segregated from a history of precedence that relies on Christian categories from the 1950s. Thirdly, the Parti Québécois even assumes that the residents of Québec would only accept a very narrow range of symbols in the public sphere! I believe it would be helpful to those seeking to analyse this recent development in Canadian law (and, for that matter, any developments regarding “religion” in human rights law worldwide) to take into account the arguments of scholars in critical religion. Using these insights, critics may be able to tackle what is, as I see it, the larger issue: that the ongoing existence of “religion” as a legal matter without a clear definition leaves room for harmful assumptions to be made and for these assumptions to become law.